This litte thing came with my second iHerb order ever, in January this year. So I've had this for quite a while, still I have about 2/3 left in the bottle. Why apricot oil? 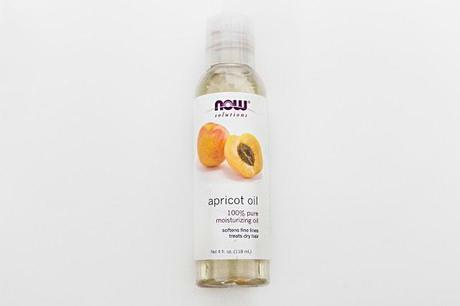 This is what NOW Foods says about this product: "100% Pure Apricot Oil is a rejuvenating natural oil that's ideal for softening fine lines and restoring a healthy glow to skin. Rich in essential fatty acids, this gentle oil has excellent restorative properties that promote soft, radiant hair and helt to soothe irritated skin. Similar in structure and function to almond extracts, oils derived from apricot kernels will naturally nourish and moisturize your skin". Doesn't that sound good? Well at first when I got it I was unsure about what I was going to use it for - I'm a bit yes/no on putting a bunch of oil in my face. But when my skin feels really dry, I can always put some of this on and it will feel soft again. My main use for this is as an eye makeup remover, it works perfect. As most oils do, really. Since this is supposed to make fine lines appear softer it's great to use under the eyes. I always feel moisturized in the under eye area afterwards, when using this. You literally need the tiniest amount of this to remove eye makeup. It's natural, no need for fancy and expensive eye makeup removers. This costs $3.18, I've had it for almost a year and I still have about 2/3 left - awesome.